Fit for Fujifilm instax mini 90 Neo Classic Instant Film Camera users. 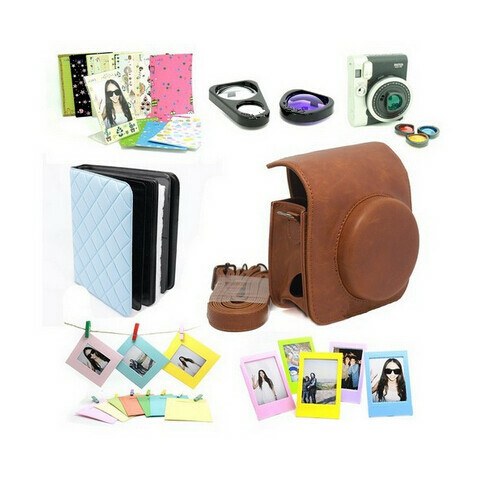 Package includes: fujifilm instax mini 90 case bag/ mini 90 close-up lens(self-portrait mirror)and filter set/ mini 90 colorful filter. Product variety, meet your different needs. Perfect as a gift, also benefit to buy. Importance: This Bundles Set do no include: Fujifilm instax mini 90 camera. To protect your mini 90, you can put it into the case bag. You can use the self-portrait mirror to take self photos. Photos taken, you can put them in the album for preserve. Shipment When you place an order, please choose a shipping method and pay for the order including the shipping fee, we will send the item within 1-5 days once your payment is completed. We do not guarantee delivery time on all international shipments due to differences in customs clearing times in individual countries, which may affect how quickly your product is inspected. Please note that buyers are responsible for all additional custom fees, brokerage fees, duties, and taxes for importation into your country. The additional fees may be collected at time of delivery. We will not refund shipping charges for refused shipments. The shipping cost does not include any import taxes, and buyers are responsible for customs duties. Returns We do our best to service our customers in the best that we can We will refund you if you return the item within 15 days of your receipt of the items for any reason.However, the buyer should make sure that the items returned are in their original contions. If the items are damaged or lost when they are returned. the buyer will be responsible for such damage or loss, and we will not give the buyer a full refund. The buyer should try to fild a claim with the logistics company to recover the cost of damage or loss. The buyer will be responsible for the shipping fees to return the items. Sizing or Fit Issues Color Mismatch Differences in color may be caused by some other reasons such as color reflection in the monitor, lighting, background etc. However, if you belive that the item recieved is in wrong color,please contact us to see if a return or refund is possible. Feedback Your satisfaction and positive feedback is very important to us.Please leave positive feedback and 5 stars if you are satisfied with our items and services. If you have any problems with our items or services, please feel free to contact us first before you leave negative feedback, We will do our best to solve any problems and provide you with the best customer services.